Zika-resistant mosquitoes were given a red-eye gene in the study to distinguish them from regular mosquitoes. The Zika virus was almost inescapable in 2016, and for good reason. The virus, first identified in Africa, is generally symptom-less. But it developed into a major public health epidemic because of its effect on pregnant women. Zika can cause miscarriage or serious birth defects such as microcephaly. In 2015 alone, there were more than 4000 reported cases, with the number continuing to rise as more people understand its link with Zika. Researchers around the world have been working to fight Zika, but now we’ve got a new update for you to sink your teeth into. Working with the University of California San Diego (UCSD), we’ve engineered Aedes aegypti mosquitoes, the biggest transmitter of Zika, to be resistant to spreading this devastating virus. We tested the Aedes aegypti mosquitoes in our quarantined insectary at the Australian Animal Health Laboratory in Geelong, our national biocontainment facility designed to research the most dangerous infectious agents in the world. 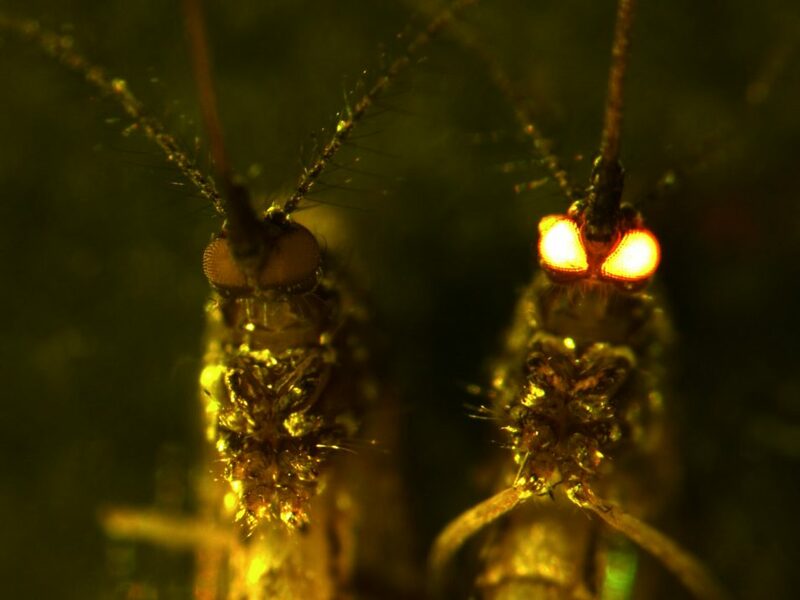 UCSD researchers engineered a gene cluster and injected it into mosquito embryos alongside a red-eye gene, differentiating them from the untreated mozzies acting as the control in this study. They found that in the midguts of female mozzies, the cluster stopped them from picking up Zika when they drank infected blood. This meant the mozzies no longer had the virus to transmit to their next feed, leading to reduced viral infection, dissemination and transmission rates. Researchers inserted the synthetic gene cluster into different sites of the mozzie genome to make sure that the physical site of insertion wasn’t the thing stopping Zika. They also found mozzies with two copies of the gene were completely unable to transmit Zika, and mozzies with only one gene also had a very low transmission rate. Mozzies with this synthetic gene cluster also lived and reproduced as well as untreated ones, suggesting they are capable of being as abundant as wild mosquitoes. Our Senior Research Scientist and paper co-author, Dr Prasad Paradkar, said while Zika has spread to 86 countries, it is not currently present in Australia – but the invasive Aedes aegypti mosquito is established in northern Queensland and the Torres Strait. Increased globalisation and international travel mean it’s quite possible that the virus could make it to Australian shores someday. While we still need to investigate further, this mozzie could potentially one day be used to replace wild populations of Aedes aegypti, adding to the arsenal of control strategies to help fight the virus’ spread. We’ll continue working with international partners to find innovative ways to reduce the risk of Zika, both for Aussies and for people around the world. So while we still haven’t figured out how to get rid of mozzies completely, at least we’re helping make their buzz worse than their bite. 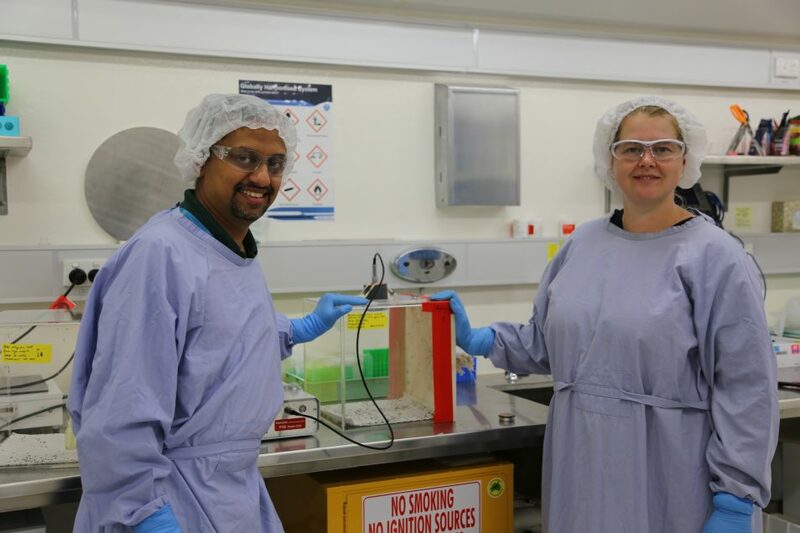 Mozzie researchers and paper co-authors Prasad Paradkar and Melissa Klein in their lab. We’re researching different ways to get invasive mozzies and their diseases to buzz off. Is the gene inherited when GM mossies mate with wild ones? These mosquitoes are not being released into the wild. But if they were to mate with wild ones, the gene would be inherited in the Mendelian fashion, which means 1 out of 4 progeny will get the gene. With time, this gene will be lost as these mozzies continue to mate with the wild ones. Can you please provide a link to the paper referenced in the figure caption – thank you! We’ve contacted the researcher and will get back to your shortly. Thanks! From the CSIRO Social Media Team. From the CSIRO Social Media team.